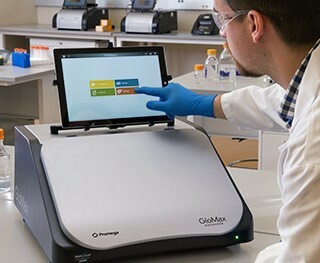 The GloMax® Navigator System is an easy-to-use microplate luminometer integrated with Promega chemistries for superior assay performance. The system provides researchers superior luminescence sensitivity and dynamic range for both strong and weak bioluminescence experimental samples as well as seamless integration with Promega industry-leading bioluminescent gene reporter, cell-based and biochemical assays. GloMax® Navigator is operated by an integrated Tablet PC, which provides quick and easy navigation through the control options. Exporting your results is easy with a variety of options, including exporting to your local data network, USB flash drive and cloud-based storage locations. The GloMax® Navigator software provides many of the required technical elements of a part 11-compliant system (user authentication and authorization, data integrity and protection, electronic signatures and audit trails) when used with the appropriate laboratory workflow. Learn more about the GloMax® Navigator System. Get Up and Running Faster with Integrated Promega Assays: Developed and optimized with Promega cell and gene reporter assays for seamless workflow. Enjoy Ease of Use: Simple tablet PC touch screen navigation with full PC capabilities and state-of-the-art graphical user interface. Experience Superior Performance: Broader dynamic range, better sensitivity and lower well-to-well cross talk for more usable data from your experiment. Export Data to your Laboratory Network: The software provides many of the required technical elements of a part 11-compliant system (user authentication and authorization, data integrity and protection, electronic signatures and audit trails) when used with the appropriate laboratory workflow. Integration with Promega reagent chemistries for detection of luminescence assays. Optimization with Promega cell, gene reporter and biochemical assays.